Oklahoma: On April 6, I traveled a route from Clinton (85 miles west of OKC) in west central Oklahoma going northeast through Custer County to Kingfisher (40 miles northwest of OKC) and then to Marshall (35 miles west of Stillwater). Although there was some good wheat on this route (e.g. the variety trials at Kingfisher and Marshall), it is posed to decline quickly unless rain is received. Most of the wheat I looked at in Custer County northeast of Clinton was small and fields were terribly dry. Wheat in this area seemed to be at GS 6-7 and I’m guessing was planted quite late due to the dry fall. The most common problem I saw were greenbug, especially in Custer County. However, as the photos show, there were many mummies present indicating the population should be crashing shortly. I also saw some stripe rust but only an infection here and there. Around the variety trial at Kingfisher, wheat was mostly around GS 9 and I saw no aphids or disease. At Marshall, wheat was at GS 8 and there was some stripe rust but at a low incidence. 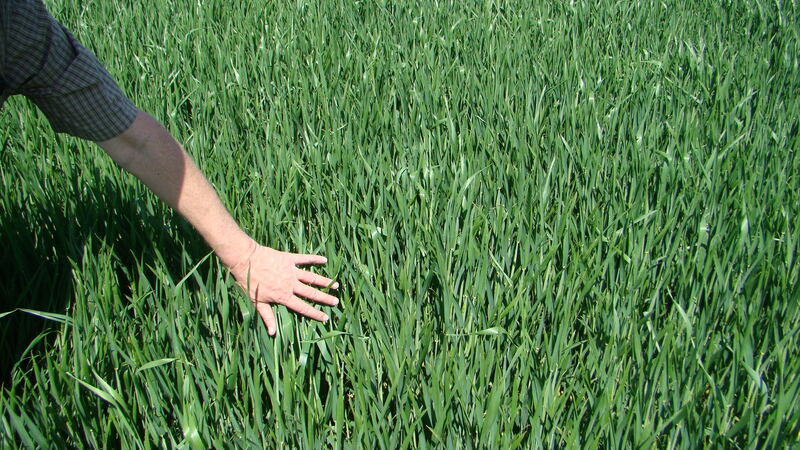 On April 7, I traveled to Frederick in south central OK looking at wheat along the way. At a variety demo 20 miles west of OKC right at I-40, I found the wheat at GS 8 with just a little touch here and there of stripe rust. Soil moisture here looked good; this area must have caught a decent rain in the last week or so. The same could be said at another variety demo straight south about 15 miles south at Minco. Here the wheat in the field surrounding the demo was at GS 9, there was good soil wetness, and the wheat looked good. I did not see any rusts or powdery mildew, but there were occasional BYD spots. Further southwest near Apache (30 miles north of Lawton) wheat was at GS 9-10 and looked very good in the variety trial as well as in fields. However, some leaves were beginning to roll and the need for moisture to continue the crop was evident. I didn’t see any aphids or diseases in wheat west of Apache, but I the variety trial just south of Apache I found some stripe rust and greenbug; both at a very low incidence. The rest of this trip was spent with Aaron Henson (Extension Educator, Tillman County) and Mark Gregory (Area Extn Agron Spec – SW Oklahoma) looking at wheat in Tillman County. Wheat in this area was mostly at GS 9-10 with awns occasionally just emerging from the boot. Some fields we visited were dry and impacted by drought, while others looked good but needed another drink soon. A few fields were outstanding and had good soil moisture. One field in particular was the best wheat I have seen since 2012. It was a field of Ruby Lee that was at GS 10 and had been sprayed on 15-Mar because of reports of severe stripe rust in the area and in northern Texas to the south. A 20 ft strip of unsprayed wheat was left on the outside of the north and west side of the field because of power lines and wind. This strip served as an excellent control to indicate the effect of the spray. 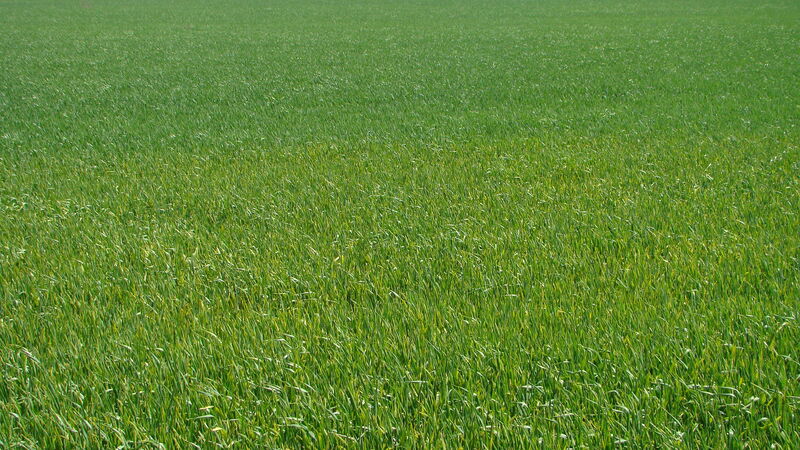 The line between sprayed and not- sprayed was visible from the road and even more evident in the field (see photos). 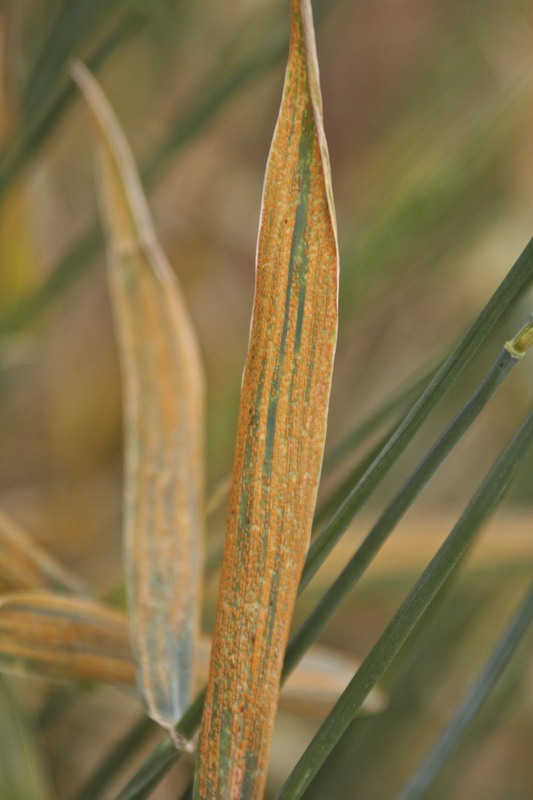 Within the not-sprayed strip, flag leaves were green with leaves beneath the flag hit hard with stripe rust (see photos). The field was sprayed a second time on 05-Apr because it has such good potential. Leaves in the sprayed area are completely green. I have difficulty explaining the complete lack of stripe rust on the flag leaves in the not-sprayed area. Likely the flag leaves were not yet emerged at the time of the first spray and then conditions after spraying did not allow spread of stripe rust to them. However, in talking to Aaron and Mark it seems there were conditions after the 15-Mar spraying that would have been conducive for spread of stripe rust. At any rate, this is an excellent example of how a timely spray did a tremendous job of protecting yield potential. 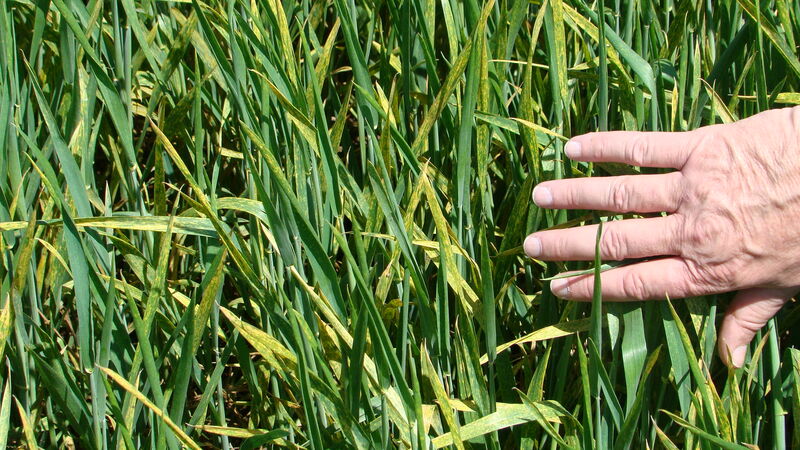 Other diseases observed across the Oklahoma include wheat streak mosaic, which has been detected in samples from several places including around Stillwater and from Noble County just north of Payne County (where Stillwater is located). However, I have not received indication yet of severe WSM; part of this may be related to the drought in western OK where WSM is typically more common. Recently samples from northwestern OK are beginning to come into the diagnostic lab, but results from some of those samples are still pending. 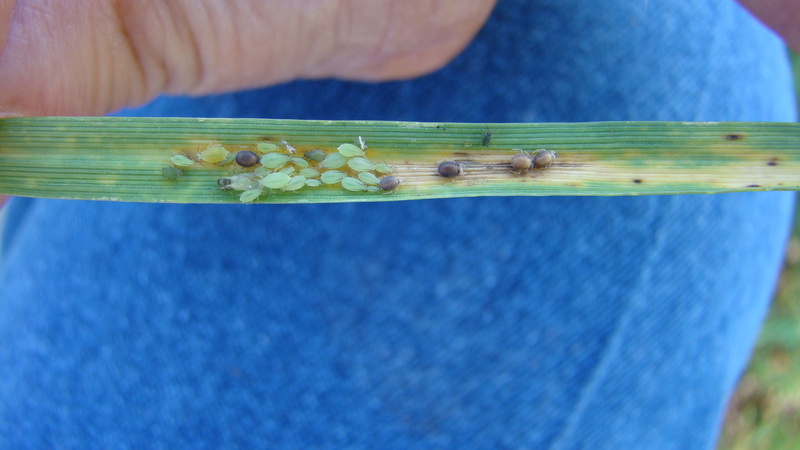 By osuwheat in Bob Hunger, disease on April 9, 2015 .